Basic Bundles include basic materials - not a lot of fluff. 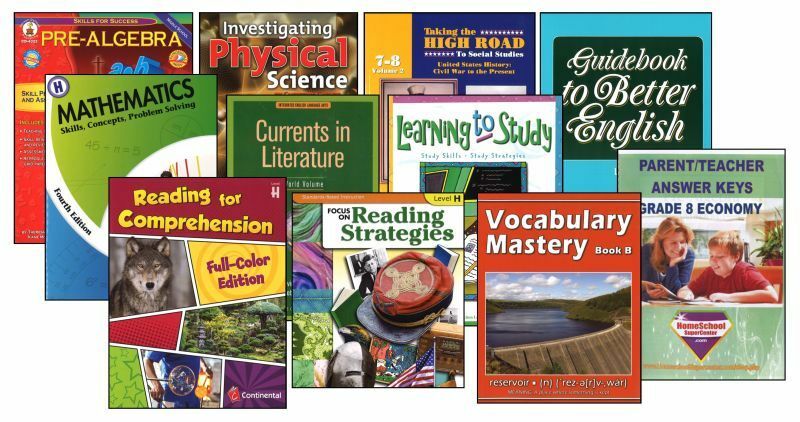 Basic Bundles, for the most part consist of soft-cover - write-in style texts and workbooks. We have compiled the best publications we can, at the lowest price possible - all bundled together to save you $ - complete with a weekly schedule to assist you. ALL THE CORE COURSES ARE HERE! and for some that's all they want. 8th grade! Last year before high, VERY, high school. We'll help you "Get it Right" this year! -MATHEMATICS PRE-ALGEBRA is always going to be part of every 8th grade package. This course includes two workbooks. One workbook is a full-color text covering the topic of General Math/Pre-Algebra. The other workbook, is a two-color text corresponding in content with Ratio's and Percents. Your student will be covering all the skills needed at this level according to the N.C.T.M. - The National Teachers of Mathematics group defining what should be taught at each grade level. And, you'll find the answer keys for both workbooks as well. -A Student Workbook with an Answer Key covering PHYSICAL SCIENCE is here for your student. This course covers all necessary, grade level, physics/physical science subject matter. It's an easy to understand course as it is presented in a format that all students embrace - A Write-in workbook course allows for mastery - and, as always - this science course is activity based. The Answer Key is included for the parent/teacher. -We integrated a Hardcover Student Text but with a write-in style to assist with your student's studies in SOCIAL STUDIES - Global Studies this year. A textbook and an Answer Key is what's on the menu. Page after page of activities, illustrations, test prep, charts and graphs covering Global Studies/Geography and History. As stated prior, an Answer Key is here as well. -An ENGLISH GRAMMAR/READING/LITERATURE workbook is part of our Language Arts course inclusion. This workbook course covers currents in Literature. This course also incorporates a hefty quantity of READING & LITERATURE too! This course utilizes a write-in workbook format - it's an activity workbook with skills improving content - not just literature and reading but also in the sub-topics of reading comprehension, vocabulary, writing, grammar, and spelling are all included in the student workbook. As always, an answer key is included. -Because this is the final year before High School, we want all our students to maintain mastery in ENGLISHa comprehensive Literary guided reader is also included. -Also included this year is a full-year VOCABULARY program. This is a softcover student workbook to assist your student in mastering vocabulary skills, word usage & word application as well as analogies and more! There's an answer key bound-in. -AND a Full-Year suggested schedule for the core courses along with a Student Planner for organization! Economy yes! All topics covered? Of course! High school's going to be a walk in the park! Basic bundles contain the bare minimum materials to meet Federal/State requirements. Parent/teachers should understand that students need to have additional and supplemental activities added to his/her school day for better understanding and final mastery of the topic(s) presented. Grade 6+ basic bundles are typically not suited for a 4 year University-bound student.